Running any type of marketing campaign takes time, there’s no denying that. Even in this age of digital marketing dominated by platforms such as Twitter, and more recently Snapchat, where messages are created and sent in an instant, there is still a lot of planning that goes into content marketing for brands. Businesses today not only have to create compelling content, but also figure out how to best share that content. With email and social media platforms both largely super saturated with content, it can feel like fighting a losing battle to connect with your audience. Thankfully, a newer type of marketing has emerged that can not only connect you with your audience better than ever before, but also save you time by way of automation opportunities. What are we talking about? I’m sure you’ve guessed it. That’s right: web push notifications. With web push, not only are you giving your content a much better opportunity at being seen (no more email newsletters getting lost in subscribers’ inboxes), you can also create several types of automated campaigns that range from promoting general content, to personalized notifications that keep your customers informed about their purchases. These automated campaigns will save you hours each week that you can then spend on other crucial areas of your business that need your attention. If you’re unsure about what automation opportunities there are with web push, keep reading to discover ten unique opportunities that you should implement immediately. And in case you were worried, these are all incredibly easy to set up. Let’s get to it. Event triggered notifications, as their name suggests, are notifications that are sent as a result of a certain action. These actions (or events) are completed by your subscribers and, once performed, the notification is sent automatically. These notifications are specific to an individual (as opposed to all of your subscribers or a segment of your subscribers), something that has become very popular in marketing. Personalized messages are appealing to customers and are seen as highly relevant, so you would be doing yourself a disservice to not enable these campaigns. Abandoned cart rates today are incredibly high (estimates put the average at around 68%). Does your store suffer from this too? If so, you aren’t alone, but are you doing everything possible to lower your rate? With an automated abandoned cart campaign, you can retarget those individuals with the hope of them returning to your store and making the purchase. When creating this campaign, you can decide how long to wait before the notification is triggered (for Shopify users the default is 1 hour, but you may add additional time if you wish), as well as the content of the campaign. For example, you may offer a discount code to help encourage users to complete their purchase. For more help, view our document on setting up abandoned cart notifications. You have the capability to send a notification automatically once a user has made a purchase. This is another campaign that you can easily create and that will trigger automatically once a purchase is complete. Most users today expect to receive some type of order confirmation after making a purchase, and this gives you an easy way to accomplish that. Finally, you have the option to create an automated campaign alerting a user that their item has shipped. This is another type of notification users have come to expect, and is easily taken care of via web push. No matter if your item ships quickly, or if there is a backorder and shipping takes some time, this campaign will trigger automatically and keep your customers automatically informed. Note: We also created a general document on creating triggered push campaigns that you can access here. We support just about all RSS feeds and allow you to easily create an automated campaign integrating with the RSS feed of your choosing. When setting this campaign up, you can use content that is automatically pulled from the RSS feed, choose your own content, or a combination of both. Finally, you decide whether to send this campaign to all of your subscribers, or only to a specific segment or segments. For instance, you may create a Tumblr RSS feed campaign and only send it to subscribers who have previously viewed that Tumblr. The choice is yours. For more help creating an RSS feed campaign, click here. You appreciate every new subscriber that agrees to be sent your notifications. Why not show that appreciation by sending a welcome notification? Previously, this would have taken a lot of time to create a new campaign for each new subscriber. With our automation, it’s taken care of for you. Simply create the campaign once, and it will trigger automatically to each new subscriber you gain. Easy, right? If you need more help with setting up welcome notifications, read our document here. This first type of automated notification is strictly based on time. You have the option to choose when this notification will repeat, choosing either daily, weekly, or monthly. You can also choose to send this to either all of your subscribers, or only to certain segments. Say a user (or users) haven’t visited your website in a week. Why not re-target them and send a notification saying you miss them? You can create an automated campaign that will do just that. You can determine the amount of time, and can also pick a certain page of your website that will trigger the notification. For example, you may base this campaign on your blog since that is a page that (hopefully) is regularly updated with new content that you don’t want your subscribers to miss out on. Don’t get us wrong, social media is a great way of interacting with your audience. With Zapier, you can combine your Facebook, Twitter, Instagram, LinkedIn, and Pinterest feeds with Aimtell in order to automate campaigns that promote your various social media posts. For example, you could automatically send a web push notification whenever you post a new Tweet, or share a new Instagram photo. Don’t ever worry about your audience missing a social media post of yours! Do you use Mail Chimp? If so, you can create an automated web push campaign that is based off of your Mail Chimp email campaign. Again, as with social media, email is a great tool, but with open rates being so low, your campaigns are likely far less effective than they used to be. 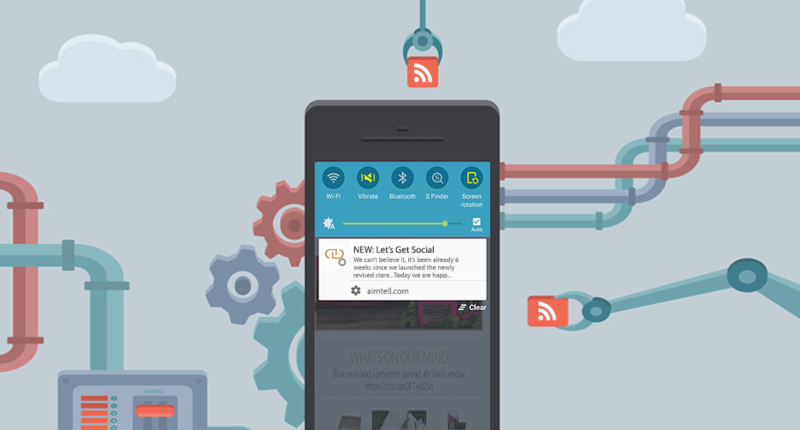 Get more views easily by sharing your newsletters via an automated web push notification. Finally, you can use our Zapier integration to create automated campaigns based on your YouTube channel. Videos have become some of the most popular pieces of content on the Internet, so why not easily get more views by alerting your subscribers whenever you publish new content? For more help getting set up with Zapier, click here. Do you have an idea for a new automation opportunity? We want to hear it! Let us know by commenting below or sending us an email. Tags: automation, digital marketing, ecommerce, web push notifications.